Are you and your partner fighting a lot? Or are you questioning if you’re even in “the right relationship”? No matter what your relationship looks like right now—and no matter what you might have done to try to make things better—and even if you’ve had some marriage or relationship counseling and this hasn’t worked, if you can answer “yes” to any of the questions above, then all of that is about to change. The truth is that if you’re like most couples, the fact that you’re struggling isn’t surprising at all. And not only that, but it’s probably not even your fault… That’s because it’s a CONUNDRUM. Did you know that most of the well-intended things that couples do to try avoid conflict, and prevent issues in their relationships…not only don’t work… but generally make things even worse instead? In his book: “Solving The Marriage Conundrum” Psychotherapist and Relationship Coach, Paul McNiff, will show you the real reasons why you’re arguing and struggling in your marriage or your relationship And not only that, but he’ll also show you EXACTLY what you can do to get past those issues, so you can completely transform your relationship—once and for all! This ground-breaking new approach, which includes 21 powerful, step-by-step strategies, will take you by the hand and show you exactly what you need to do to take back your power, dissolve your resentment, reconnect with your partner, and stop fighting—completely—even if your partner isn’t willing to work on it… and even if your partner won’t admit that there’s a problem (yet). EXACTLY what you CAN do to take back your power, get past the issues that have been keeping you stuck, fall back in love with your partner and completely transform your relationship—for good! 5.0 out of 5 starsBrilliant book!! Easy to read and it's made a huge difference to my relationship! Normally I don’t write reviews, but this book is great, so I think it deserves a good wrap. So I thought I’d share what I think about it. My partner and I have both read a lot of self-help books about relationships over the years. And many of them are pretty lame. But this one just makes sense. It’s really easy to read and it was written in a way that made it feel like I was having a conversation with the author… about my relationship. From the first chapter, I could see all the things I was doing wrong in my relationship, and also my past relationships...it just really made it so clear. And I couldn’t believe how much I related to what was being said. As I was reading it I was thinking " Has this guy met us? How could he know this is happening in my relationship?" It was just spot on! And not only did it show me what I had been doing wrong, but when you read it, use the strategies at the end, because they really work. They seem pretty simple, but I’ve got to say that they made a huge difference. 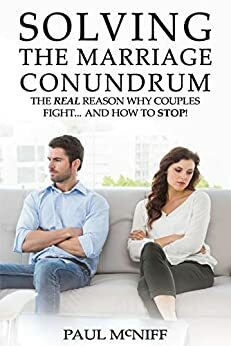 So if you're having some trouble in your relationship and like me, you’re fighting a lot, then do yourself a favour and get this book. You'll gets heaps out if it. It’s really helped my relationship!